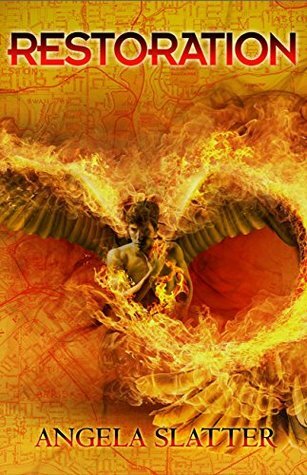 Verity Fassbinder thought no boss could be worse than her perfectionist ex-boyfriend – until she grudgingly agreed to work for a psychotic fallen angel. And dealing with a career change not entirely of her own choosing is doing nothing to improve V’s already fractious temper. The angel is a jealous – and violent – employer, so she’s quit working for the Weyrd Council and sent her family away, for their own safety. Instead of indulging in domestic bliss, she’s got to play BFFs with the angel’s little spy, Joyce the kitsune assassin . . . and Joyce comes with her own murderous problems. Before I was invited to the Restoration Blog Tour, I hadn’t heard about Angela or the series, but I’m glad I had the opportunity to read the trilogy! The series was very well written and I love that she’s an Australian author who set the books in Brisbane! I’m located near Brisbane, but not close enough that I’m super familiar with it, so I wasn’t too sure about the accuracy. However, I enjoyed it whenever a place was mentioned and I had a rough idea of where it was because so many books are set in the US or Europe and I’m quite unfamiliar with those places haha. The overall storyline was very good, the plot kept me on my toes and I found it difficult to put the book down! Occasionally the pacing felt a little bit too fast, but it didn’t bother me too much. I was so immersed in the world Angela created and reading the series felt very effortless and easy. There seemed to be a lot of sub-plots to the main plot, but I was very happy with how they all connected together in the end. The ending was a bit too abrupt for my liking though, I felt that Angela had spent so much time setting up the story and going through the sub-plots that it felt lacking when it came to the final ending of the story. There were so many characters! I was surprised to see that they had quite a good depth to them for the amount of characters that make an appearance. Some of the characters did have relatively similar names, so I would get a tiny bit confused, but overall not a major problem. I loved how strong the women in this series were! Verity was the epitome of a badass, and her sassy sharpness made me laugh a few times. I loved how she looked after her friends and family, and she was a very likeable character! Overall I recommend this book if you’re looking for a witty, well-developed adult-level fantasy series written by an Australian author! I wish more people had read the series, as I truly felt like it was a lesser-known gem of a trilogy. A special thank you to Hachette Australia for the blog tour opportunity and for providing me with review copies of the trilogy. Please note this does not affect my opinion of the book.